If you feel like the porch on your house is underutilized perhaps it’s a sign that it needs a bit of styling to make it more inviting. The porch is like an extension of your house and it should emulate the same pleasant atmosphere. This is a spot that creates an important first impression, so it represents a great decorating opportunity. Showing off your hospitality can only be done if the porch seems welcoming and designed for relaxation and entertainment. 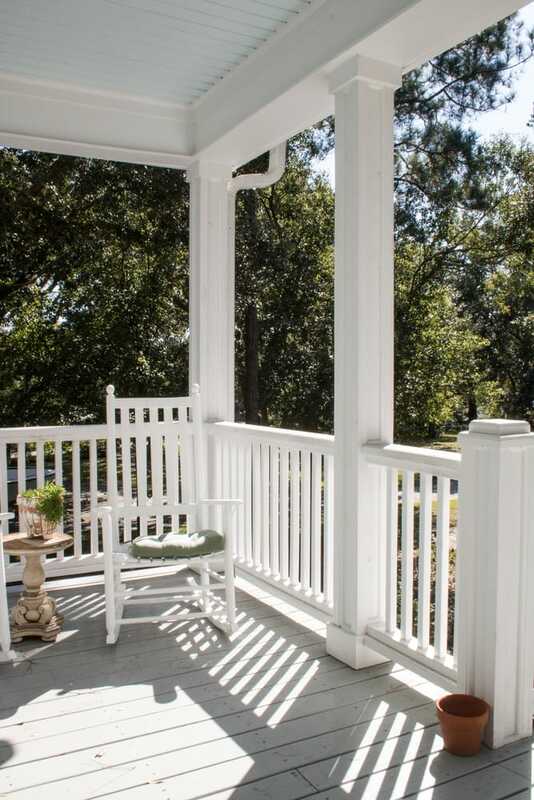 Porches come in distinctive designs and some of the most popular options are open porches and screened porches. 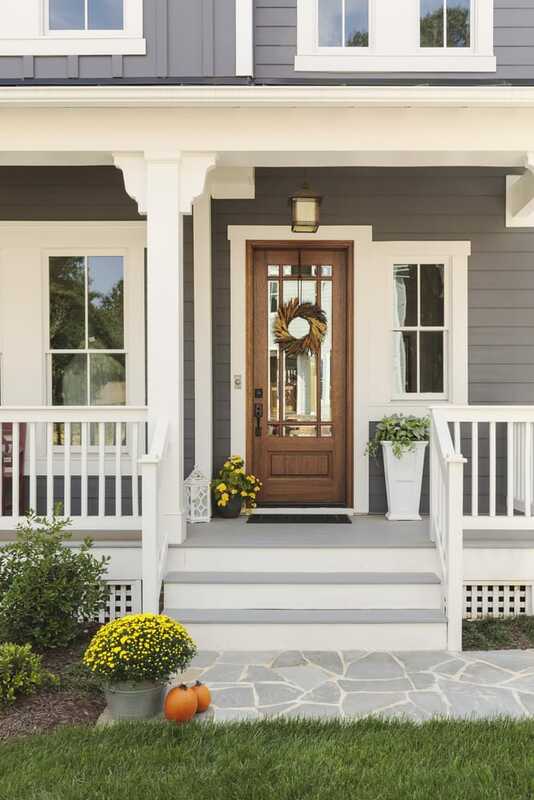 Open styles have wide steps and they have that classic look that usually comes to mind when you think of a front porch. Screened porches are better adapted to deal with abundant insects so you will usually find them in more temperate regions. The covered porch is similar to the screened porch, but it has a bit of extra coverage to protect the space from the sun more effectively. The last type of porch is the wraparound which is frequently associated with older homes. 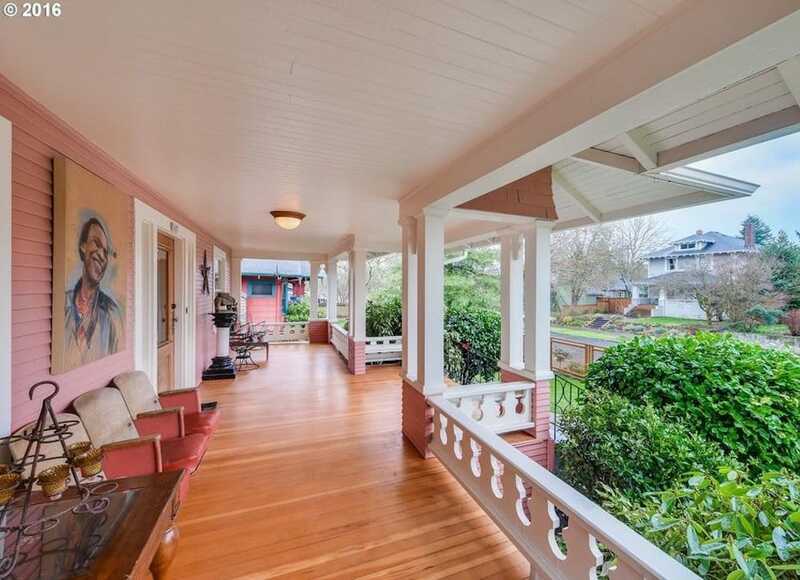 This type of porch is designed to wrap around a side of the house. Let’s see the most creative ways to design and decorate your porch. You can find a lot of inspiration in the following ideas which can help you get the porch back into shape in no time. 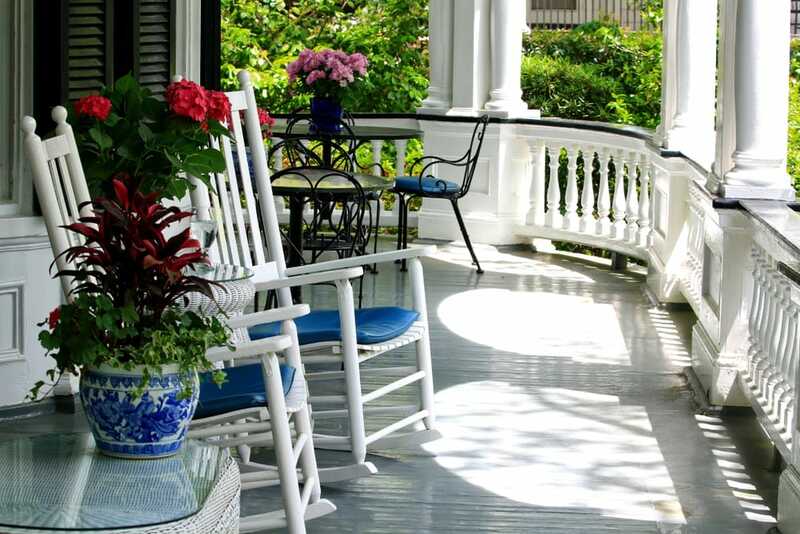 The porch is one of the first things that visitors to your house will see. For this reason, it’s a good idea to make the area feel as cozy as possible. The best way to achieve that is by including some welcoming seating options. It doesn’t matter if you don’t have a lot of space available on your porch. Try to include at least a couple of chairs with some soft cushions. Perhaps a glider like this one from Amazon would be a great choice. Those with extra room should consider adding larger pieces such as benches. For some extra coziness, you can try adding some texture with the help of a stylish rug. Try to look at the entire picture when analyzing the look of your porch to ensure you create an inviting space that won’t have too many empty spots. 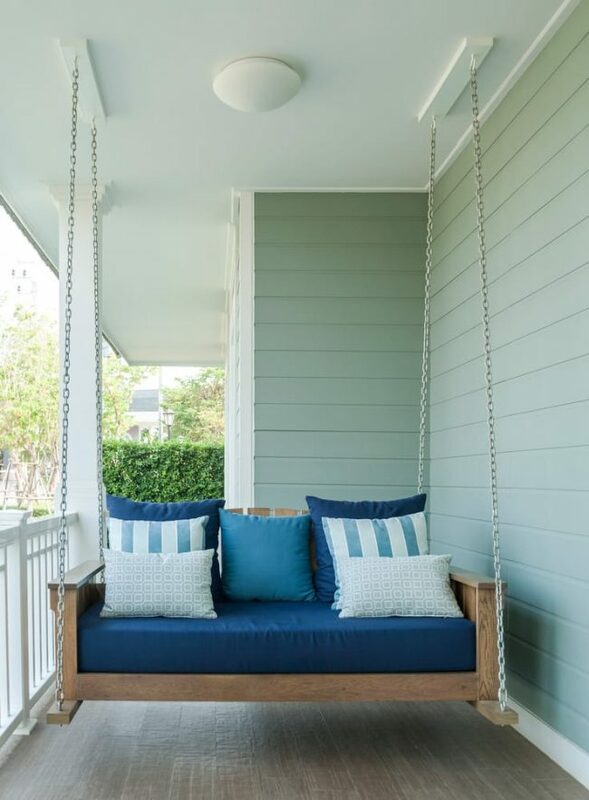 The swing is a staple of porch seating and you should definitely try to incorporate one if you want a rustic touch to your home. There are lots of options out there, but we recommend the handmade craftsmanship of this porch swing from Amazon. It’s durable and comfortable with a very attractive eco-friendly finish. Well-placed plants on the porch have a striking effect. They provide an excellent opportunity to add some interesting color and make the porch feel more lively. If you prefer the minimalist design style, you can also stick with a more neutral color palette. 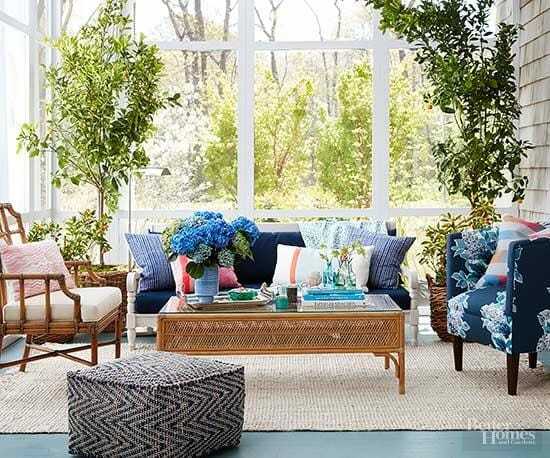 Decorating with plants outdoors will usually follow the same principles when decorating indoors. That means you can mix smaller and larger plants to create a multi-layered green look. Hanging flower pots or other plants such as ferns represents another beautiful idea. The lighting on the porch is important as this is a great place to sit even after the sun has set. Some powerful light fixtures need to be added here to keep a comfortable level of illumination for everyone. That being said, make sure you avoid exceedingly bright light bulbs and consider choosing a warmer type of light which contributes to the feeling of coziness. If you already have some decent lighting in place and only wish to further enhance the ambiance, try adding some string lights or soft-glowing Edison light bulbs. 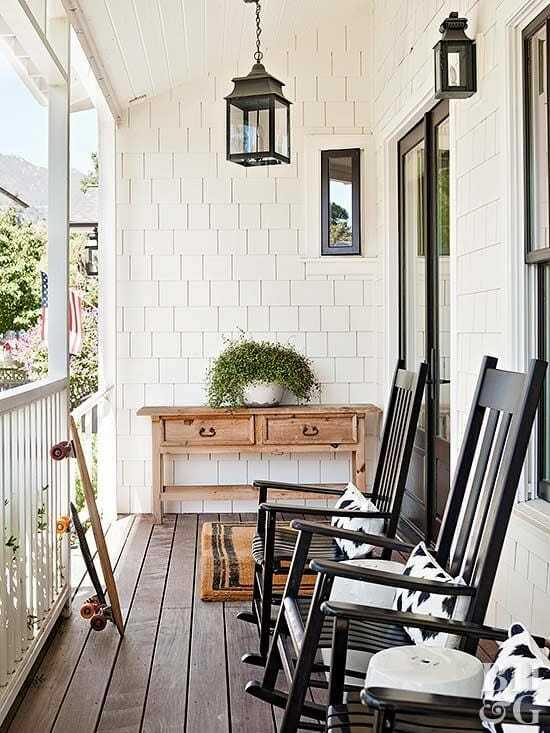 Wall hanging lanterns can also work for some porches. Take a look at these stylish solar lanterns from Amazon. They can be used to decorate your porch with a realistic dancing flame effect. 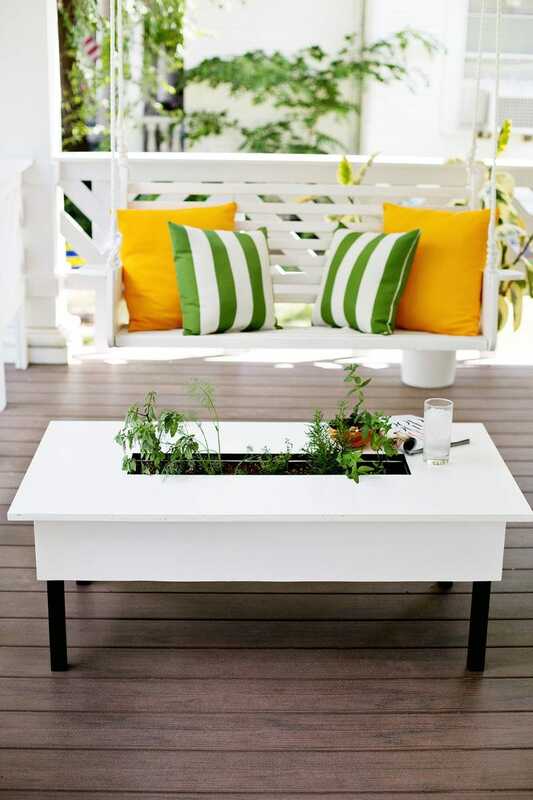 Here’s an interesting idea for your porch in case you’re not afraid of some DIY work. Take a coffee table and incorporate a small herb garden that allows you to take a sprig of mint and instantly freshen up your drink. This can be especially great for those who frequently enjoy sitting outside on the porch for a fun cocktail night. 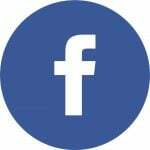 Check out the full tutorial for this project at this link. Many homeowners don’t like the idea of a porch that lacks a sense of privacy. If you prefer to transform the porch area into a more private space, consider adding some wooden shutters which are sure to shut out prying eyes. There are many methods to enclose a porch, but this works better compared to others as it still allows a gentle breeze through. Those living in warmer climates will also appreciate the excellent sun protection aside from the generous airflow. Imagine having your own outdoor room where you can sit and relax without worrying about neighbors invading your privacy. 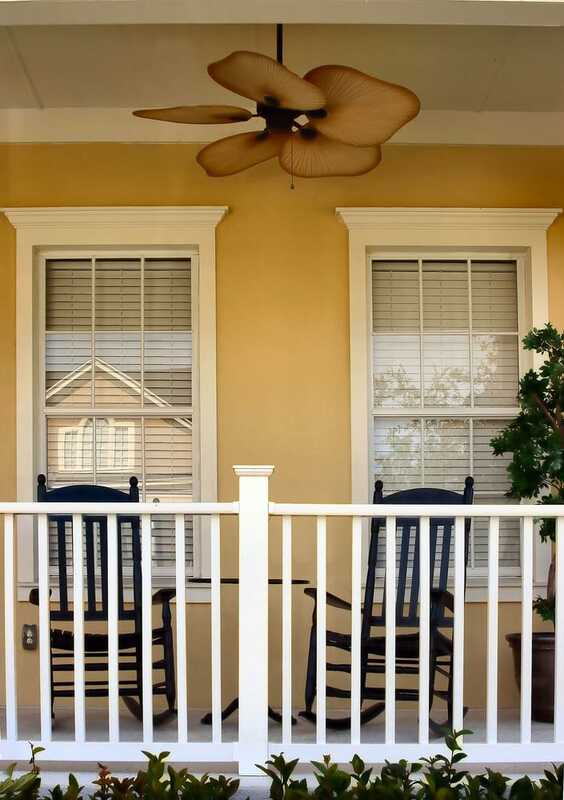 There are lots of solutions to tone down the strength of the sun shining down on your porch. A more creative one is to install a sunroof which acts as a filter for the light and provides a beautiful effect with shaded spots. A pergola will most likely require an ample area. Stand-alone models can be found at most specialized stores. Check out this cedar pergola from Amazon. Sitting on the porch and sipping your drink can be a very relaxing experience in the summer. When the heat outside becomes too uncomfortable, it’s important to keep the air fresh with a cool breeze. There are lots of tricks to do this without relying on an air conditioning unit. One of our favorites involves the installation of large ceiling fans. They can be quite functional and offer a nice style benefit if you paint them in matching tones for the rest of the porch’s elements. If you like 2-in-1 products, you will probably love this outdoor ceiling fan found on Amazon that comes with an included light kit. Home bars are effective solutions if you wish to add a solid point of interest to your home. 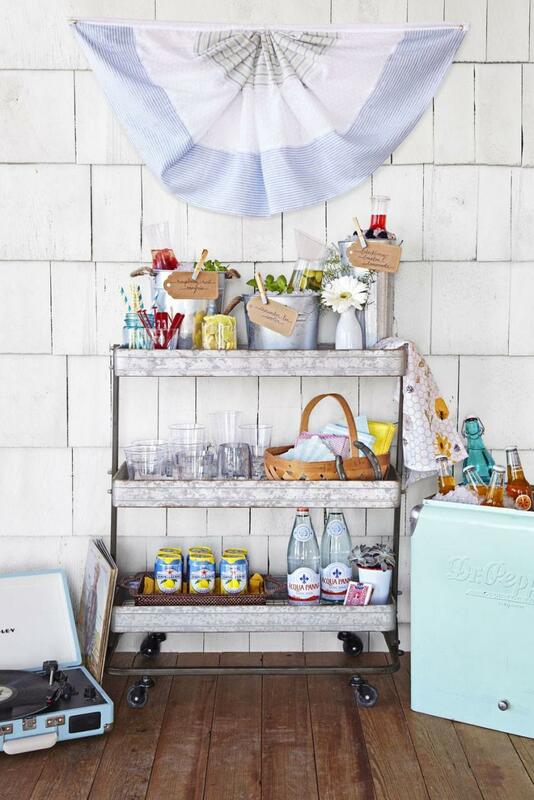 The porch is another place that’s sure to benefit from a simple bar that can be very popular with your guests. If you’re short on space, consider stocking a bar cart with all the essential drinks and other accessories. Check out this stylish bar cart from Amazon that’s equipped with wheels and a cooling bin. The perfect solution to make your porch a point of attraction. Regardless of the kind of porch design you prefer, it’s always important to properly focus on the look of the front door. It’s obvious how guests will take notice of the front door, so consider emphasizing it with some decorations. Whether by painting the door or flanking it with some planters, the front door needs to create a favorable first impression. It’s an essential part of the porch. One quick fix to make it stand out is to add a more vibrant-looking doormat like this colorful model from Amazon. A front porch will usually look great with wood flooring, but that doesn’t mean that other options should be excluded. If you wish to make the porch stand out some more, consider using a different material. Ceramic flooring is an amazing solution in that regard as it also provides a cool feeling underfoot. Those who prefer a more modern look will probably like the stylish vibe it creates. Go for large-format tiles to suit the size of your porch. 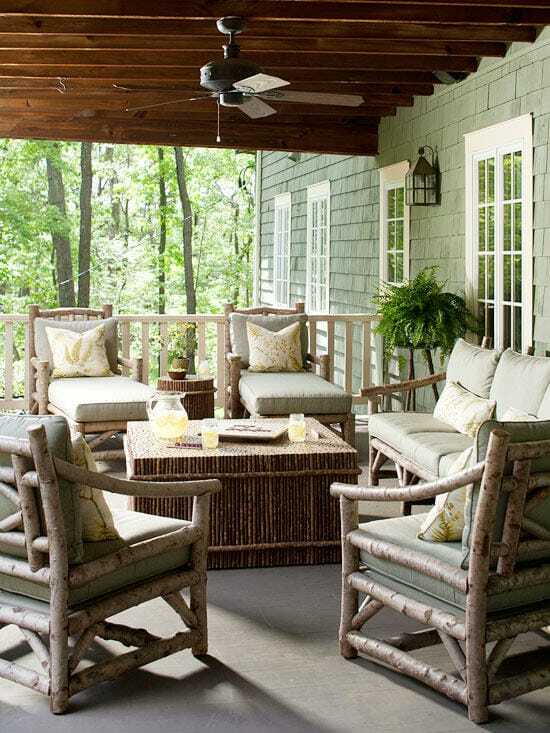 Many people like the rustic look when it comes to decorating their porches. If you want to add some farmhouse flair, there are some casual decorations that can help you obtain this look. 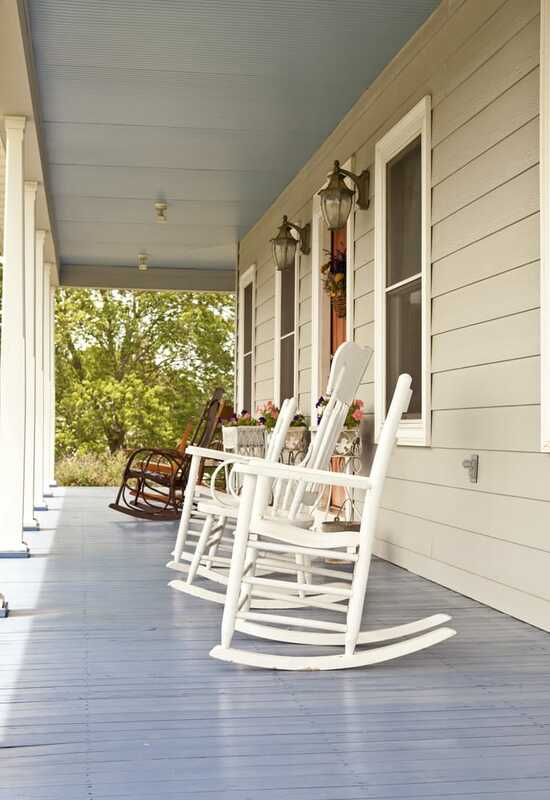 The open design of a front porch could use some relaxing rocking chairs and a simple furniture piece made of wood. To complete the look you could add a large doormat for texture and some pendant lights for rustic illumination. Check out this lighting fixture on Amazon. Porches can be used in a more functional manner if you prefer it that way. 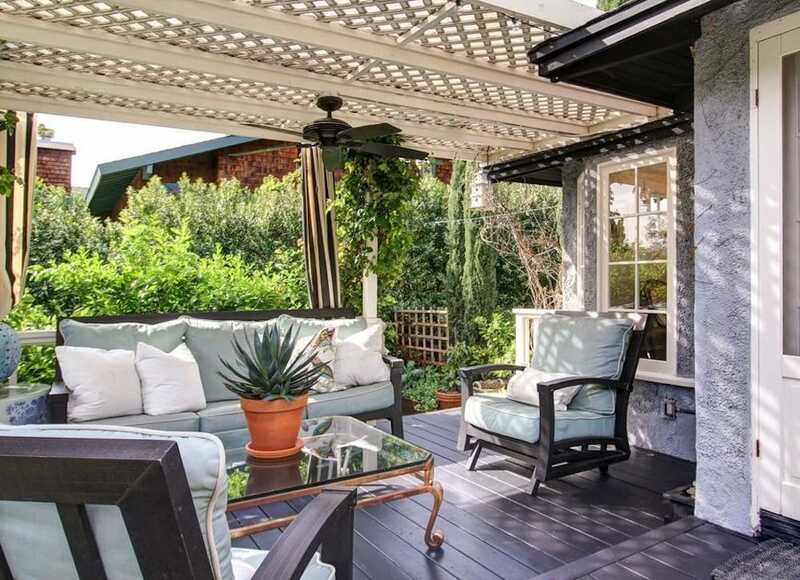 This space can be easily converted to accommodate an outdoor dining area. 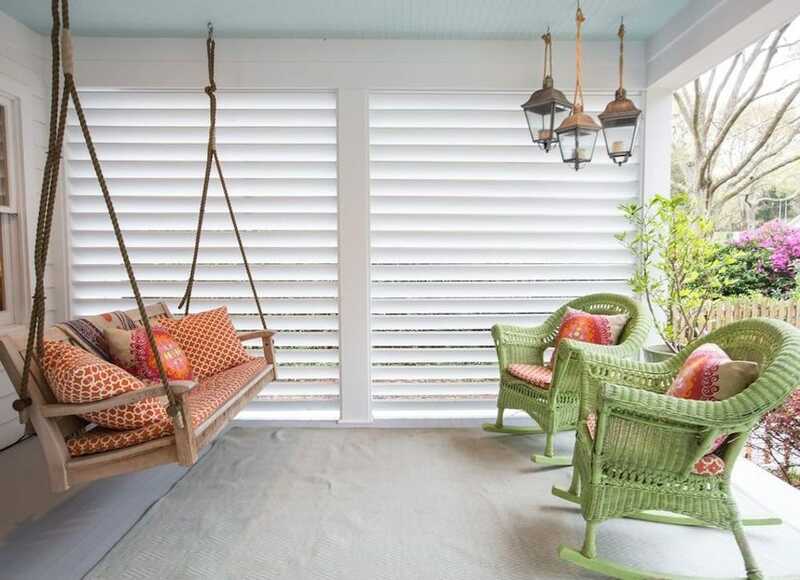 Wall-to-wall screens will ensure that insects don’t bother your guests while they savor a refreshing summer meal. Adding plenty of greenery and some comfortable furniture are just some of the must-have elements that need to be included. A monochrome porch may look elegant in some situations, but others can get a gloomy feeling from it. 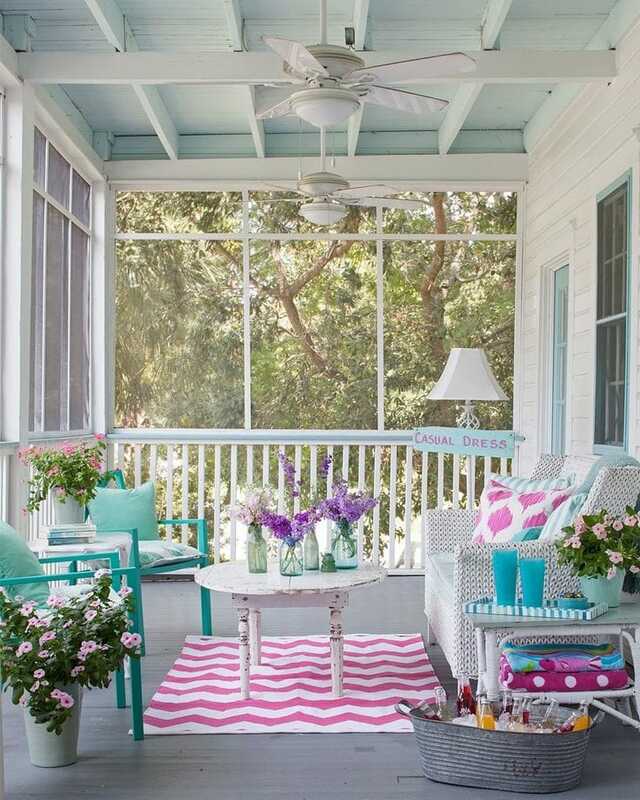 To stay away from that kind of uninviting vibe, consider adding some cheerful color combinations to create a pretty porch. Those who live in warmer climates can make use of some vibrant splashes of color to make the atmosphere more pleasant. Think of using a gray floor as your base where you can contrast various pastels such as turquoise on the chairs or pink from the rug. Lots of colorful flowers can also contribute to the cheerful ambiance. If you’re lucky enough to live near a beautiful forest, you shouldn’t miss on the opportunity to create a matching design for the porch. To make this area blend in with the woodland surroundings, the best solution would be to incorporate furniture made from three branches. Add some soft cushions to allow your guests to relax and enjoy the natural beauty of the forest. There’s no need to select some flashy colors for the fabric as it’s important to keep a similar theme with the look of the surrounding area. A fireplace can add a very romantic vibe for a porch, particularly if we’re talking about a house with an ocean view. At night the temperature can drop considerably even if during the day the air is hot. This is why a fireplace can represent a perfect solution to stay cozy during the chilly evenings. Even during the cold season, you can still enjoy relaxing outside on the porch. Choose a stone fireplace if you wish to create a rustic lodge vibe. Moss walls can bring some natural beauty indoors for a calming effect. 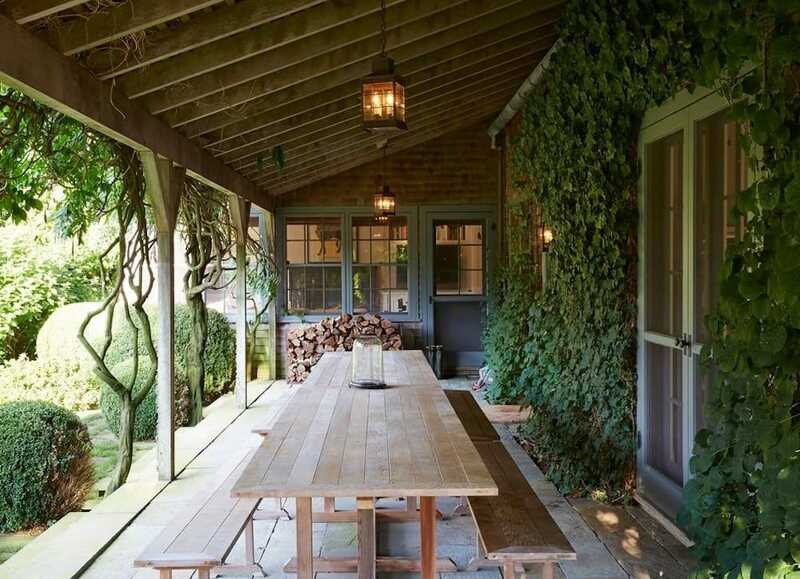 The porch is another place that can make use of a wall of greenery. We like the idea of incorporating ivy on your front porch to create the impression of extra closeness to the natural world. Climbing vines can also take your mind to an older time as they provide a kind of vintage ambiance. Artistic souls will probably jump on any opportunity to show off their treasured artworks. Displaying art on the front porch represents precisely the kind of solution to try if you want to add some artistic flair to the house. This is a great idea as it doesn’t really require huge costs. Hanging your favorite artworks is a decorating technique that allows you to bring a personal touch to the front porch. Tiny porches are more difficult to work with given how a small space can be limiting for larger pieces of furniture. That doesn’t mean you can’t make the best of it. 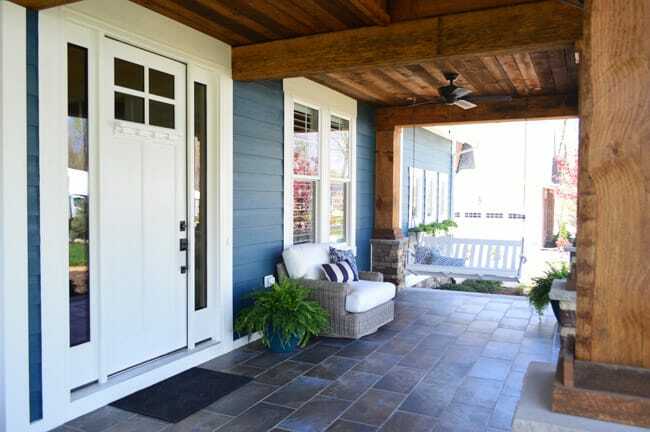 You simply need to incorporate some space-saving solutions to create a functional porch without creating a cramped feeling. 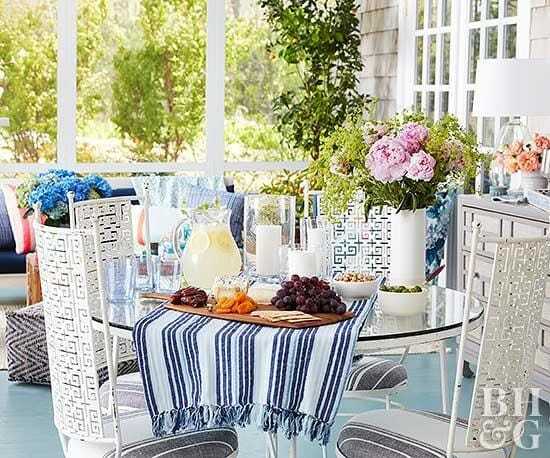 Start by adding a long table with slender chairs. Window screens offer protection against the elements allowing for year-round usage of the porch. 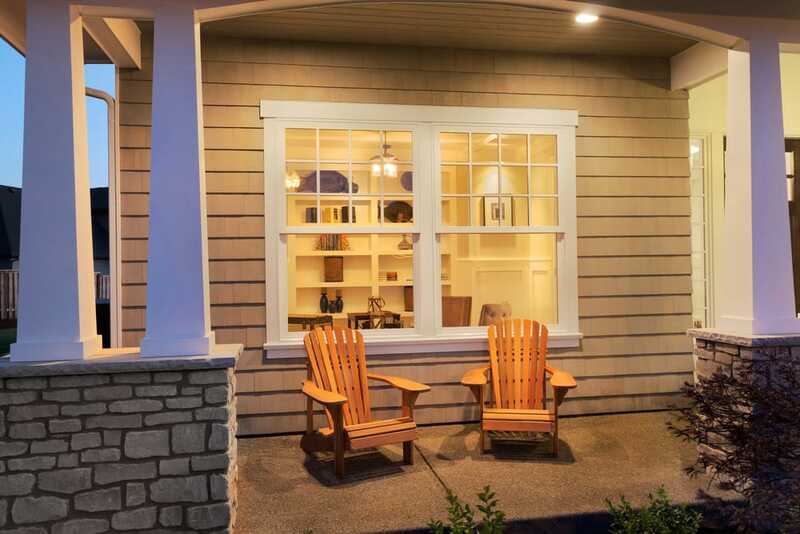 Designing your porch with large windows can enhance the feeling of airiness. Integrate some slim furniture pieces made from wicker and bamboo. These are recommended if you wish to create the illusion of expanded space in an otherwise tiny porch. 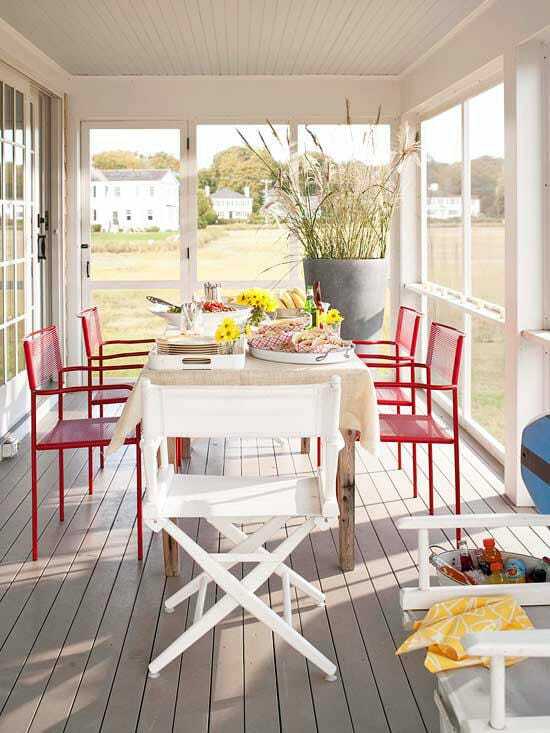 The small profile of the furniture helps to keep the porch bright and lofty.